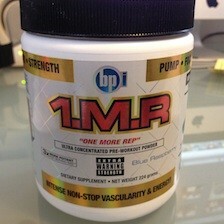 Just finished off my supply of the 1.M.R pre-workout drink formula and figured it was time to write a review about it. I went with 1.M.R mainly to try something different after using Jack3d twice. Had a good experience with Jack3d but wanted to see if any of the other pre-workout drinks were better. Probably spent 10 minutes looking at the entire shelf of pre-workout formulas at The Vitamin Shoppe near my house before picking 1.M.R. Can’t remember why I picked it over the others. Maybe because of the Blue Raspberry flavor. Was interesting seeing the water turn blue when I dropped a scoop into my cup. Wasn’t real keen on the taste. Like Jack3d, the tingles set in after 20 minutes. Did one of the Insanity Asylum workouts with it running through my system. Not sure if I noticed more energy doing the workout than if I did not take it. The one thing I did notice was it felt like the entire dose stayed in my head and did not circulate through my body. Was different then Jack3d because it felt like 1.M.R didn’t move to the muscle group I was using at the time. With Jack3d I could feel that muscle group burning with whatever I was doing. How Often Did You Take 1.M.R? I used 1.M.R before every single Insanity Asylum workout, before a couple of my softball games, and when I was going out for a long bike ride. Pretty much before every intense workout. How Long Did Your 1.M.R Supply Last? A good 5 months. This stuff is so potent that most of the time I’d have to scale it back to a half scoop or less. I workout at least 4 days a week and play double header softball games twice a week. For me to take so long to finish 1.M.R with being as active as I am says how strong this stuff is. Especially when I was using it almost daily. Any Side Effects From Taking 1.M.R? Somedays I would feel the effects of taking it the day before. Felt like going through withdrawals sometimes. Didn’t have a smooth increase and decrease of energy. Was like an angry energy. The biggest side effect I felt that I didn’t like was it really dehydrated me sometimes. There were numerous times where I felt thirstier than normal during a workout and playing softball. A couple of times I had to stop because my body wasn’t functioning the way it should. Would You Buy 1.M.R Again? Probably not. Taste wasn’t so bad but it did not deliver the same results as Jack3d did. 1.M.R boasts about their ultra concentrated servings on the label but it was too intense of a kick with a hard coming down period. It also had this overly chemical feeling to it. My body was not digging it as much as it did when I took Jack3d. The biggest reason why I probably won’t buy 1.M.R again is because of the dehydration. It felt like it sucked all the moisture out of my body and left me with a hangover. My experience with 1.M.R was not as good as the one I had with Jack3d. 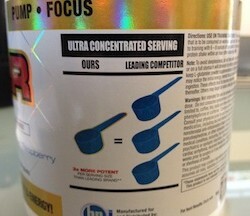 To be honest, I was excited when I took my last scoop of 1.M.R. I’m sure others may disagree but I’m more into a smooth increase of energy and focus to get me through the workouts without the hangover feeling. I have seen the benefits of taking a pre-workout drink and will continue to do so. Not sure if I’ll go back to Jack3d just yet as I’m going to try the new P90X pre-workout drink. 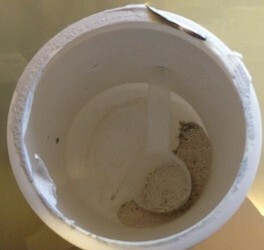 From what I have read about it there are more natural ingredients in it then any other pre-workout drink on the market. Beachbody has a good track record of making quality products so I’m hoping it works out for me as well or if not better than Jack3d. Have you tried 1.M.R? What was your experience with it?